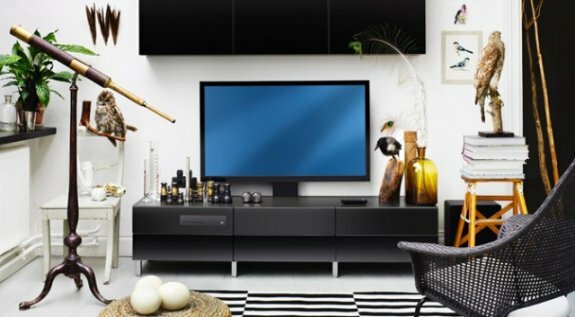 ExtremeTech reports IKEA has designed Uppleva, a range of home entertainment systems that feature an LCD TV, a 2.1 sound system and a Blu-ray player, all integrated into one piece of furniture. The concept eliminates the usual cable mess behind your TV, with Uppleva you'll see just two cables; the power cable and aerial. Uppleva will come in three different designs, with a range of screen sizes starting at 24 inches. If the built-in Blu-ray player isn’t enough, there are two USB and four HDMI ports down the side of the screen, and an empty “bay” that can hold a games console, TiVo, or another set-top box of your choice. In true IKEA fashion, the whole caboodle will come in a range of colors (white, light wood, dark wood, black, and so on). Prices start at 6,500 Swedish Kroner (around $950) — presumably for the 24-inch version — which is a fairly good deal. Uppleva will only be available in a few European markets to start with, but the UK and North America should see it in early 2013. I never thought I’d see the day where we’d write about IKEA on ExtremeTech, but really, this is a stroke of genius. While power users will dig around to find the best TV or Blu-ray player, most consumers really just want to buy a TV and Blu-ray player. Uppleva will have just two visible wires — power and aerial. Uppleva will have just a single remote control, too — an unobtainable fantasy for most modern-day households — and a wireless subwoofer!